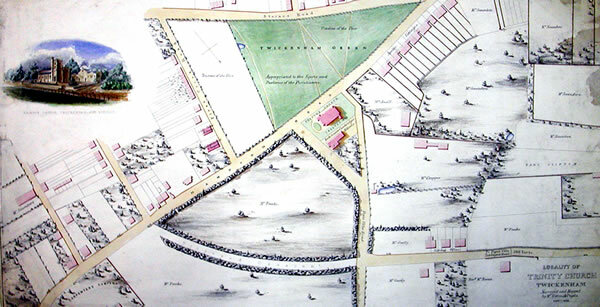 Twickenham Common showing Gifford Lodge and its neighbours engraved by Thomas Boydell in 1753. 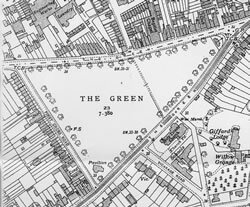 Twickenham Green is the surviving fragment of the eastern section of old common lands called Hounslow Heath. Hounslow Heath was once part of the extensive Forest of Middlesex. Between the 17th and early 19th centuries it was the most dangerous place in Britain. Highwaymen, lurking in trees by the lonely tracks, robbed wealthy travellers. Map of The Green showing current boundaries. In the early 19th century much of the common lands and countryside were fenced and passed into private ownership. Some parcels of land were retained for common use and Twickenham Common was one of these. At that time the Workhouse was on the north side of the Common. Half of the Common was used as the Workhouse Allotment for growing vegetables. The remainder of the land was allocated to the 'Twickenham Poor'. It was set aside in 1818 as part compensation for the loss of fuel rights on the Common. A map drawn by the pupils of Mr Gittins School in 1850 shows the allotment land still reserved but the remainder described as "Appropriated to the Sports and Pastimes of the Parishioners". Today the whole of the Green is used by families and residents. Twickenham Cricket Club runs a number of teams from its clubhouse on the Green including the Colts for youngsters.